Premium air efficiency motor uses less air so wrench works longer, users will also appreciate the added benefits of the light weight composite housing. An excellent choice for most heavy duty automotive and industrial uses. 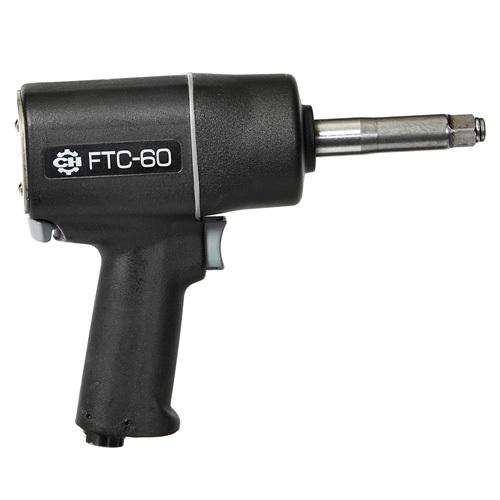 The Campbell Hausfeld FTC-60 impact wrench with Forward Torque Control (CL006000AV) is the perfect air tool for automotive service shops or the skilled do-it-yourselfer. Designed to snug lugs before the final torque setting, this high-powered impact wrench features Campbell Hausfeld’s patented Torque Control Technology to prevent lug and nut damage. The twin-hammer clutch construction provides a smooth, balanced impact for the maximum torque available in a 1/2-inch impact wrench. Users will appreciate the added benefits of the lightweight composite housing, the easy-to-use forward/reverse toggle switch and the 2-inch extended anvil for use with flip sockets and deep tire wells. An excellent choice for most heavy-duty automotive and industrial uses. Fixed forward torque (max. 60 ft.-lbs.) prevents overtightening. Full torque (800 ft.-lbs.) in the reverse direction to easily remove stubborn lug nuts. Premium air-efficiency motor uses less air so the wrench works longer.